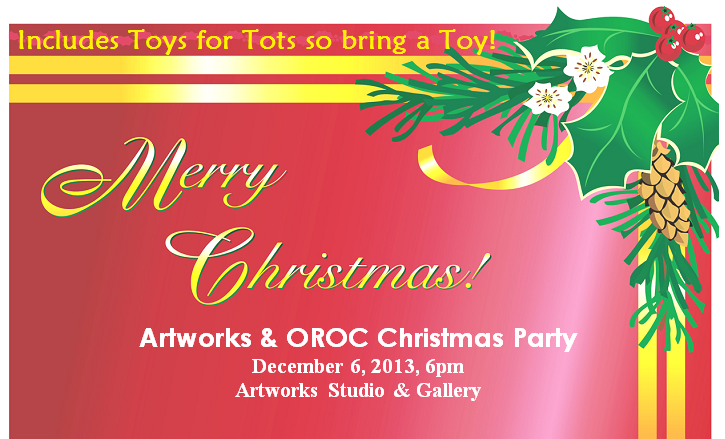 Join us all at Artworks Studio & Gallery on December 6th, 6pm, for our annual Christmas Party. We will have a lot going on and hope you can join us to make it a fun and festive night. Old River Optimist Club will be co-hosting the party this year with us and we are glad to have such a great local charity group join us. Toys will be collected for the Toys for Tots campaign. Bring a new, unwrapped toy for a boy or girl to help make some young child's Christmas one to remember. 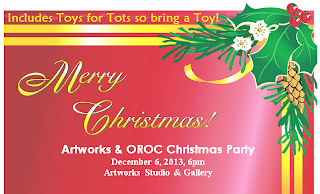 The Marines will be joining us and collecting the toys at the end of the party. All gifts are appreciated. We will have a book signing and an art auction plus plenty of party snacks, drinks and live entertainment. More details will be posted here as possible. The public is welcome to join us so tell all of your friends.